Please note that this meeting differs from our normal monthly general meetings - it's on a Tuesday and it starts at 6 pm; we do this to avoid scheduling conflicts at the meeting location. February 5 was the deadline to become a new member and vote at the general membership meeting, BUT if you have not lapsed membership in two years, you can pay your dues on the floor and vote. And of course, we encourage your membership in the neighborhood association at any time. And come in ny event! Meet your neighbors! • Notice At the SRCC annual elections meeting of the general membership of SRCC on Tuesday, March 6, 2012, officer elections will be held at Grace United Methodist Church, 205 East Monroe. According to our by-laws only dues-paid members can vote. If you've been a member during the last 2 years but are not current with your dues, you can pay at the meeting. For all others there is a 28-day waiting period after joining before a member is eligible to vote. That means that February 7 was the deadline for NEW members to pay dues and vote in the election (mail an SRCC membership form accompanied by a check made payable to SRCC [memo note: membership], along with the completed form, to: SRCC, Attention: Treasurer, Post Office Box 40632, Austin, Texas 78704). Preceding the election will be a potluck supper beginning at 6 pm, followed by entertainment at 7:15, and by the elections at 7:30. Children are welcome. Yes, tonight, we can get into the church for set-up and leaving off of food beginning at 5:30. That's the basement Fellowship Hall at Grace United Methodist at 205 E Monroe. Everyone, please come. This evening is mostly to share a meal with neighbors and to elect officers for another year beginning next month. 5:30 - 6:15 Arrive, greet, set tables, etc. • Notice At the SRCC annual elections meeting of the general membership of SRCC on Tuesday, March 8, 2011, officer elections will be held at Grace United Methodist Church, 205 East Monroe. According to our by-laws only dues-paid members can vote. If you've been a member during the last 2 years but are not current with your dues, you can pay at the meeting. For all others there is a 28-day waiting period after joining before a member is eligible to vote. That means that Tuesday, February 8, was the deadline for NEW members to pay dues and vote in the election. If you have questions about your status, email srccmemberships@gmail.com. To renew your dues, please print out and complete the SRCC membership form. Send a check made payable to SRCC (memo note: membership), along with the completed form, to: SRCC, Attention: Treasurer, Post Office Box 40632, Austin, Texas 78704. The latest statistics counting the number of views and individual visitors to this home page and the number of neighbors on our e-mail list have been posted; they are updated through the end of June. It's possible to compare these most recent numbers with what they were a month ago, or a year ago, or back at the beginning. • Our Austin Police Department district representatives serve region 4 (the southwest district, west of IH-35; see region 4 map) and region 3 (east of IH-35; mostly Henry 1 and a little bit of Henry 2 in the south central sector; see region 3 map). Officer Robert Barboza, 974-8246, is assigned to our part of region 4. Officer Atilano Guerra, 974-4475, is assigned to Henry 1. Officer Ray Lopez, 974-5551, is assigned to Henry 2. Commander Ernesto Pedrazo (telephone 974-50130 leads region 4. Commander Patrick Ockletree (telephone 974-8505) leads region 3. The main telephone number for the south central or Henry sector of region 3 is 974-8106. The main number for region 4 is 974-8241. There is additional information linked from the district representatives page of the Austin Police Department. • to report grafitti or tagging for removal, call 974-1028. • Austin Police Department loss-report form is available both at the site of the neighborhood e-mail list (downloadable from the files section) and by clicking here (MSWord document that can be faxed to the police department). •Neighborhood coffee klatsch Meet your neighbors informally on the first Monday of each month between 9:30 and 10:00 am at a location to be announced on the neighborhood e-mail list; all are welcome. (more information). 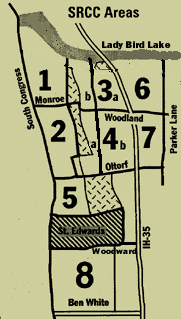 Among the links and information available at this site are: neighborhood e-mail list, history of bylaws and articles of incorporation, including original SRCC constitution, plus an old prediction that the close-in south neighborhoods would disappear to give way to the central business district by the year 2000. Meetings of the general membership are the first Monday of each month, 7:15 pm, at Grace United Methodist Church, 205 East Monroe. Meetings of the executive committee (officers and area coordinators, with all welcome to attend) are usually on the third Monday of each month, 7:15 pm, at the church. Membership Please mail completed membership form, along with your check for dues made payable to SRCC (memo note: membership), to SRCC, Post Office Box 40632, Austin, Texas 78704, Attention: Treasurer. Please furnish name, mailing address, e-mail address, and telephone number. Additional contributions may be dedicated to the SRCC general fund (see the membership form), amended as of November, 2012. Blunn Creek Nature Preserve is on the above map east of area 5, south of Oltorf Street, and north of St. Edward's University (see detailed map). There are always opportunities to volunteer to help maintain this neighborhood wonder Courtesy of Sergio Chapa, take a virtual tour (many spring photographs) if you have the bandwidth.